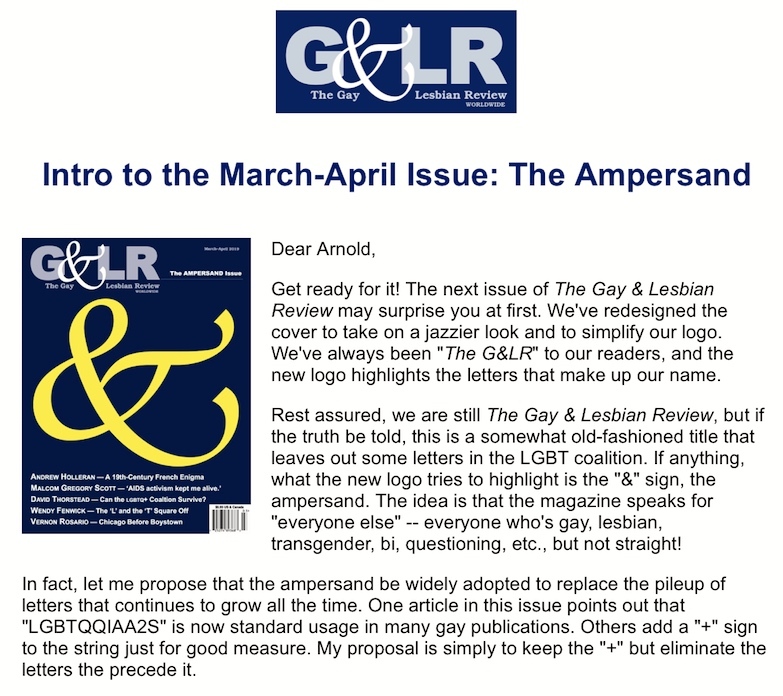 A question I took up at some length back in 2011, first in a 1/23/11 posting on this blog, “The alphabet soup of sexuality and gender”, then in a 3/11/11 paper at the Stanford SemFest: see the handout for this talk, “Categories and Labels: LGBPPTQQQEIOAAAF2/SGL …”, on labels in the SIP domain — of sexuality / sexual orientation, gender / sexual identity, and sexual practices — as used to construct an initialism for the entire domain. and they cannot be expected to be. A good name is short enough to be memorable, but a good definition is often expansive and complex, and always refers to an intricate web of concepts and their labels. So the G&LR‘s naming instincts are good, and their current decision reflects the fact that LGBT now has very wide currency in talk about the SIP domain, so it makes sense to build on existing practice. This entry was posted on February 14, 2019 at 7:04 pm and is filed under Abbreviation, Classification and labeling, Gender and sexuality, Initialisms, Names, Publications. You can follow any responses to this entry through the RSS 2.0 feed. You can leave a response, or trackback from your own site. My husband is co-chair of what was created a while back as the Cambridge (MA) LGBT Commission, which recently changed its name to the LGBTQ+ Commission (I won’t swear that I have the order of the letters right). Apparently that + caused some issues with city bureaucrats who weren’t sure if it could be handled properly by their software, or something.